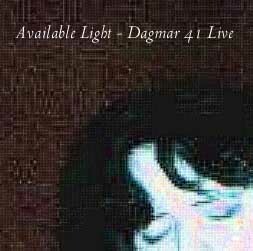 Available Light is a CD-R of recent live takes. As the title suggests, these are mostly audience recordings, ie. bootleg quality, but certainly listenable and strongly indicative of what she sounds like live. As is evident from this set list, most of these songs are older, pre-"Ferric" ones that have become Dagmar's live standards... two notable exceptions: Henry Lee is the traditional tune made semi-famous by Nick Cave and PJ Harvey, presented here in a rollercoaster piano version, and The Unconscious Life is the Peter Hammill song, played on the spur of the moment and included here by kind permission from the man himself. Not Argentinian: trusty and time-honoured opener, recorded a the ESG church with attendant reverb and grand piano... and the paper-eater in the lyric was my sister!